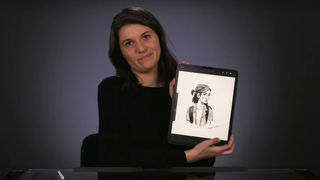 To celebrate the Blu-ray release of Solo: A Star Wars Story, co-writer John Kasden joined StarWars.com for a special Facebook streaming showcase of what fans can expect in hour and change of bonus content included with the film. Kasden introduced various segments throughout the 15-minute showcase and also included a few behind-the-scenes tidbits from the making of the film. First, some insider looks at what exactly goes into making a Star Wars film including a featurette on "Remaking the Millennium Falcon," which was described in the script as “a sports car in a junkyard.” The team went through several iterations of exterior paint designs before settling on the one seen in the film. Joonas Suotamo, who plays Chewbacca in the film, also gave a behind-the-scenes look at the physicality of portraying our favorite Wookie. Did you know Chewie lifts weights at the gym? The train heist may be one of the most memorable moments in Solo, and it was no easy feat for the filmmakers. A featurette shows the difficulty of shooting on location in Italy where the snow was prime for cast snowball fights, but roads had to be built just to get there. Star Thandie Newton said, “It was like going on camp with the Star Wars team.” Now that sounds fun. Two more clips gave insight into the creatures used in the film and also the care that went into creating Han's speeder, which brought an “urban environment feeling” into Star Wars. Plus, a deleted scene from Han's time as an Imperial Cadet gives further context for Han's background. You can grab the Solo: A Star Wars Story Blu-ray with all of the special features mentioned above on September 25.